The Mayor of Wallasey (Councillor G.L. Reakes) yesterday (Friday) received an invitation to be present at Westminster Abbey on Coronation Day. We are asked to state that whilst the Mayor deeply appreciates the honour he has respectfully declined the invitation as he is anxious to spend the whole Coronation week in the service of his Council colleagues and the people of Wallasey who have placed him in the position to receive it. The invitation was issued by the Earl Marshal (the Duke of Norfolk) at the command of the King. The Mayoress (Mrs F.H Thornton) and the Deputy Mayor (Alderman F.H. Thornton) will, we understand, witness the Coronation procession from a Government stand in the vicinity of Palace Yard. In the Abbey will be the Lord Mayor of Liverpool (Alderman W. Denton), who is the brother to Mrs. Thornton, and the Lady Mayoress, who brother is Alderman Thornton. 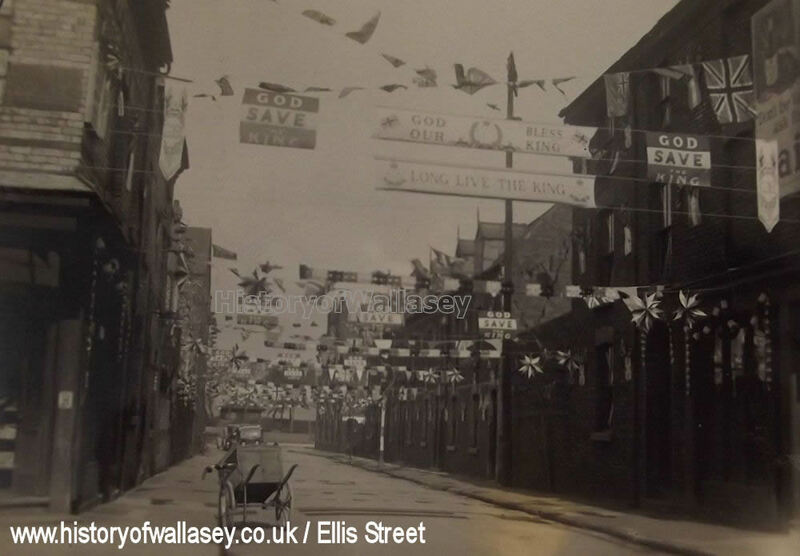 His Worship is anxious that the festivities should be worthy of the occasion and he is appealing to the public to assist the local authorities in making Wallasey's celebrations memorable. At the last meeting of the Council, he urged everyone to do their utmost in the way of preparation and that all decorations to business and dwelling houses would be made ready in good time to obtain the right atmosphere. A preliminary public service for all denominations in the Town Hall on Sunday evening, May 9th, beginning at 8-15. On the morning of Coronation Day, May 12th, there is to be a civic service in St. Hilary Parish Church, at 9.45. After the Mayoral party and representatives of organisation's taking part in the procession have entered the church, the remainder will proceed to the Central Park, via Broadway Avenue, Belvidere Road, Kingsway, Seaview Road and Liscard Road. At the park, the band of the Argyll and Sutherland Highlanders will play until 11 o#clock, when the broadcast service will begin. 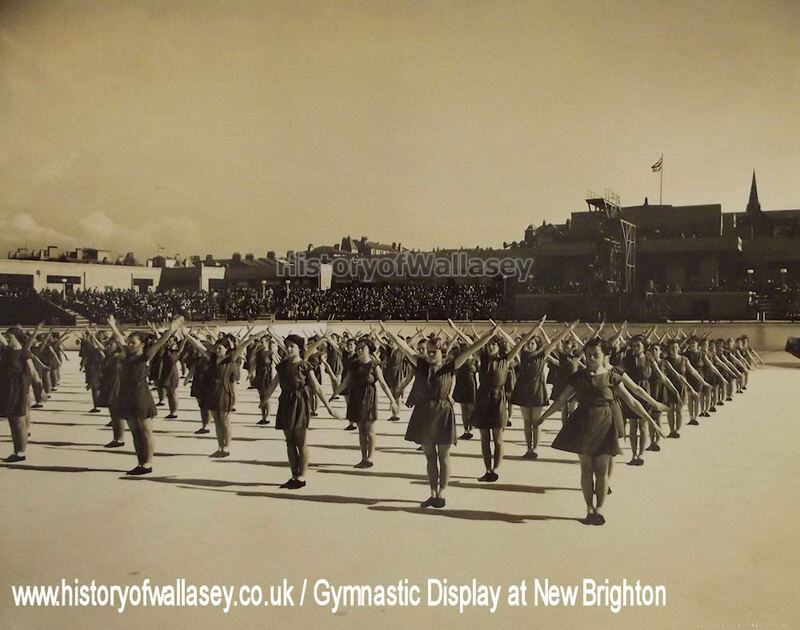 The arrangements for the display of physical culture at New Brighton Bathing Pool on Monday, May 10th, have been approved. The children taking part are to be provided with the necessary and shoes, at an estimated cost of £250, and they are to be permitted to retain the articles afterwards. The ferry steamers "Royal Iris" and "Royal Daffodil" will be decorated and illuminated, and also one of the Corporation motor buses. a) Dwelling houses with an assessment of £13 and under. b) Dwelling houses with an assessment of over £13. Postcards should addressed to the Town Clerk, Town Hall, Wallasey, by competitors who desire to enter for the prizes offered. Following is the programme of local Coronation Celebrations as arranged to date. it is of course, subject to revision by the Reception Committee of the Council. 3 pm and 7.30 pm - "Pierrot on Parade" on the Pier. 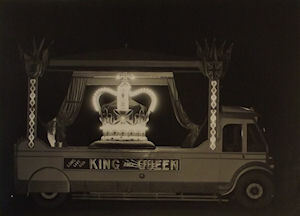 7.30 pm an illuminated and decorated motor vehicle will drive through the borough. Certain streets and buildings will be decorated and after sunset the ferryboats Royal Irish II and Royal Daffodil II will ne illuminated. 8.15 pm - Civic service at the Town. The Mayor, aldermen, councillors, magistrates and others will be present and the service will be conducted by the Revs. Canon A.S. Roscamp, H.P. Berkeley, W.J. Hartley, and A.C. Don, and will be addressed by the Revs. W.S. Coad and Hermes F. Johnson. 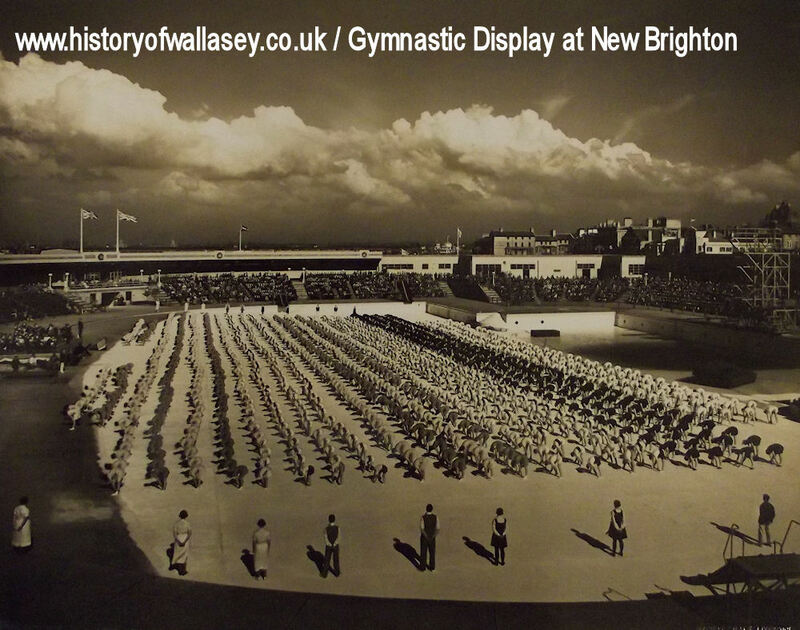 3 pm and 8 pm - Display at New Brighton Bathing Pool by school children. The band of the 1st. Batt. Argyll and Sutherland Highlanders will play selections of music. 7.45 pm - Frank A. Terry's Coronation Empire Broadcast performance. Part proceeds to local hospitals. 3pm and 8 pm - Band of the 1st Batt. Argyll and Sutherland Highlanders (with pipers and dancers) at the Floral Pavilion. 3 pm - Presentation of souvenirs to school children, teas and entertainments in the various schools. 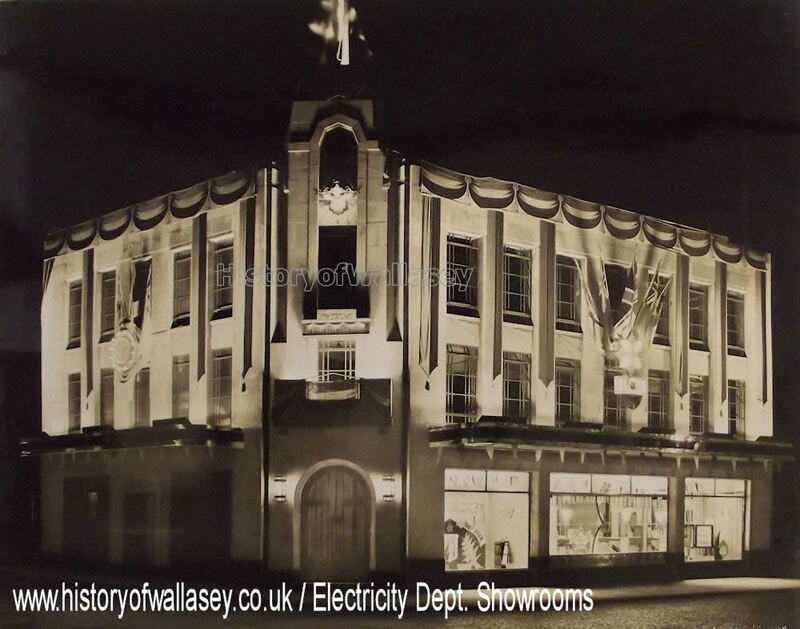 8pm - Wallasey Tradesmen's Club dance at the Town Hall. St. Alban's Church dance at the Grosvenor Assembly Rooms. 8.45 am - Assembly for Civic Service at St. Hilary's Church, conducted by the Rector of Wallasey, the Rev. N.L. Betts, M.A. 9.45 am - The Mayor, aldermen, councillors and others will assemble at Manor Road Schools and proceed to church via Manor Road, Wallasey Road and Claremount Road. Mayoral party will enter church while remainder will proceed to Central Park and there disperse. The band of the 1sr Batt. of Argyll and Sutherland Highlanders will lead procession and will play selections up to 11 am. 10 am - New Brighton Bathing Pool will open for bathing for the summer season. 11 am to 3 pm - Broadcast of Coronation Service. 2 pm to sunset - Special celebration in Moreton area consisting of a fancy dress carnival, sports, races, dancing on the green, Punch and Judy show, minstrel show, football match, firework display and bonfire. The Shore Road Silver Prize Band will play at intervals. 8pm - The band of the 1st Batt. 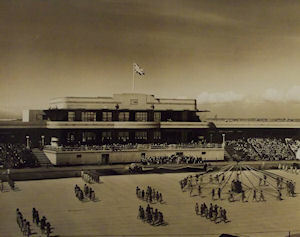 of Argyll and Sutherland Highlanders play at the Floral Pavilion. 8 pm to 2 am - Oldershaw Old Boys' Association Dance in the Town Hall with Roy Fox and His Band. Net proceeds in aid of the Victoria Central Hospital. At 5 pm and 9 pm - Special river trips from Seacombe and New Brighton. Mayoral reception and entertainment to old people at the Town Hall. 3 pm and 8 pm - Band of the 1st Batt. Argyll and Sutherland Highlanders (with pipers and dancers) at the Floral Pavilion. 3 pm and 8 pm - Band of the 1st Batt. Argyll and Sutherland Highlanders (with pipers and dancers) at the Floral Pavilion. 3 pm - Band of the 1st Batt. Argyll and Sutherland Highlanders (with pipers and dancers) at the Floral Pavilion. 9.15 pm - Firework display from King's Parade, near New Brighton Bathing Pool. Frank A. Terry's special show at the Floral Pavilion. Five shorts weeks ago a handful of residents of Byron Road, Seacombe, got together. They said to each other, "Now Coronation Day is going to be the greatest day pf the year, especially for the children. Why not form a committee and arrange a day of festivities for the children? 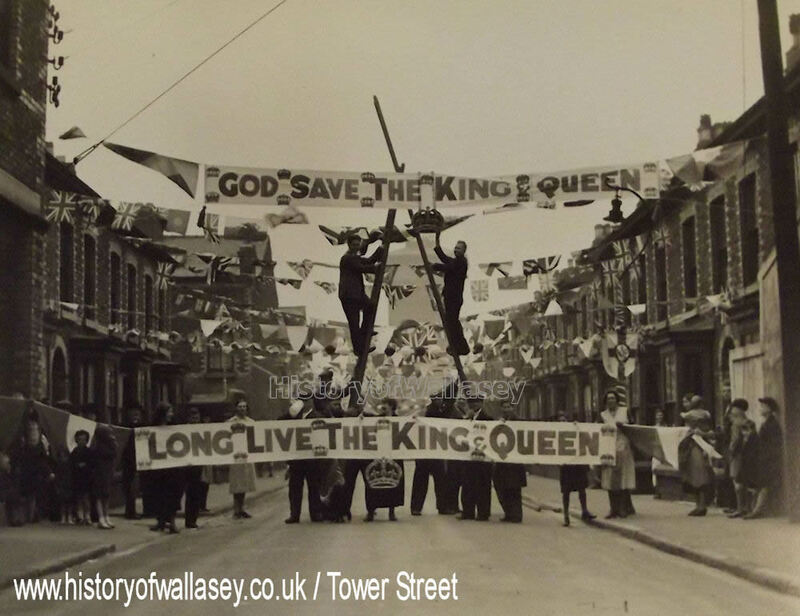 Let's show the people of Wallasey that Seacombe residents are not going to be lacking in patriotism." And in those five short weeks, the handful of patriotic men and women have laid out a programme and the children of Byron Road will have a party in the street on Coronation Day. The Committee responsible for this good idea and who have put in such hard work during the past month include : Mrs A. Noteman (President), Mr. John Tobin (chairman), Mrs. W. Stacey (treasurer), Mr. Maxfield (secretary), Mrs. E. Price, Mrs. Wootton, Mr. E. Roberts, Mrs. B. Fuge, Mr. W. Fitzpatrick, Mr. H. Tilsley, and Mr. T. McKaigue. The committee had raised money in many and varied ways to provide this party for the children and to buy bunting to decorate the houses and several residents have helped greatly by gifts. Mr. R. Burns have been busy fashioning and painting shields which will be hung above the street. Shields have been made from cardboard procured from local shopkeepers. Mr. John Tobin, chairman of the committee in an interview, with a "Chronicle" reporter yesterday, said: "it is very gratifying to see how well the committee have worked together. In five weeks an ambitious programme has been arranged and we are determined that the children will have a good time on Coronation Day. We are working under great difficulties owing to lack of funds but everything is going nicely now, and the children will get their party whatever happens." Wallasey magistrates yesterday granted applications by more than sixty local licensees for the extension of hours on Coronation Eve and Coronation Day. The extensions were from 10 to 11 pm., on May 11; and from 10.30 to 11 am., 2.30 to 3, 5 to 5.30 and 10 to 11 pm. on May 12. Mr. J.M Rigby, who applied for most of the licensees, said familiar facilities had been granted in Liverpool. An application by Mr. Dunn, on behalf of the proprietors of the Japanese Cafe, Tower Gardens, for extensions from 9 pm to 10 pm. on Thursday, Friday and Saturday in Coronation week, was also granted. Work on the official decorations by the Corporation is now in full swing. It consists of the draping by means of flags, banners, pennants, shields and pylons, the lamp standards in certain sections of the promenade and streets, together with the most important of the public buildings. 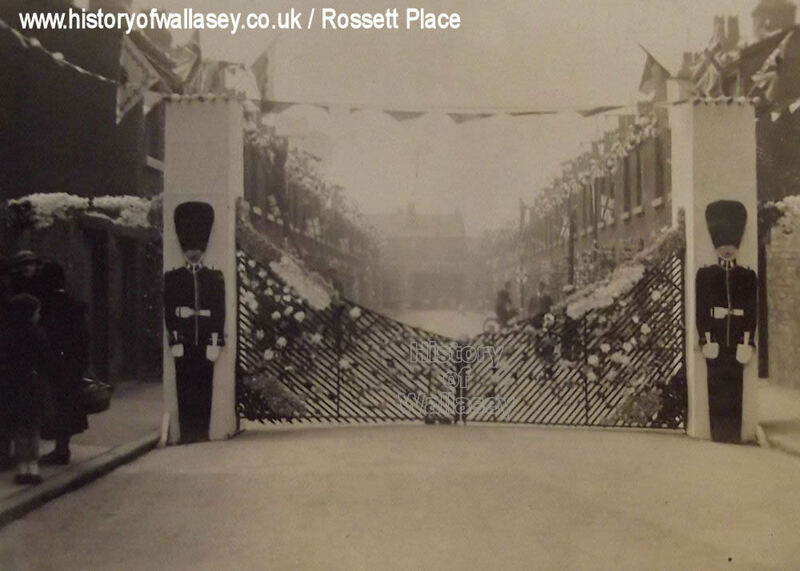 As the cost of decorating the main roads and streets from end to end would be prohibitive and tend to localise any decorative scheme, the Reception Committee considered its advisable to distribute the decorations in such a manner that a large portion of the borough could be represented. 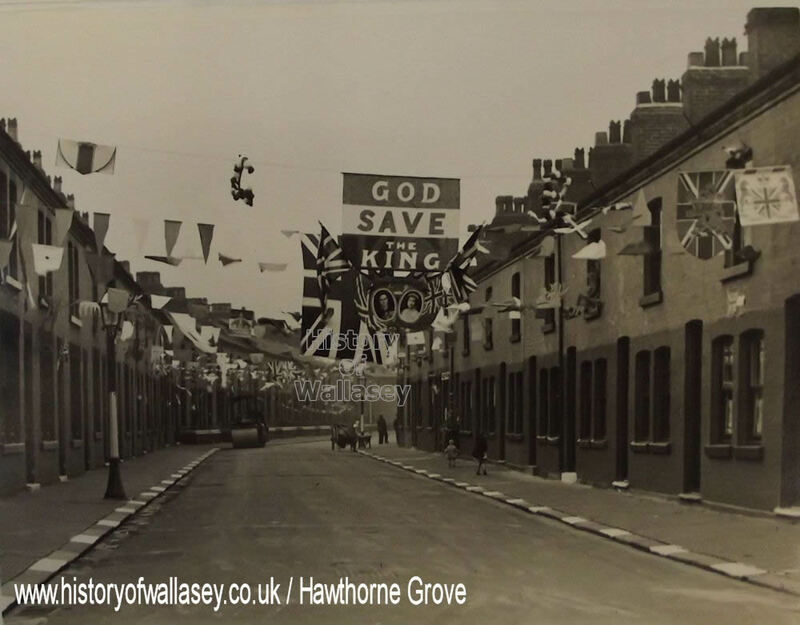 Decorations have been arranged at Moreton Cross roads, and practically the whole of Liscard and Wallasey Villages, also the junction of Borough Road, Wheatland Lane and Poulton Road, the promenade near New Brighton Ferry, Egremont Ferry and Seacombe Ferry Piers. The motifs forming the decorations are arranged on each side of lamp standards and the effect produced by the varied colours of the real bunting flags and banners should be gay and effective. At Seacombe Ferry approach, being the gateway to the borough from the river, four tall gilded pylons ornamented with flags and shields are erected. 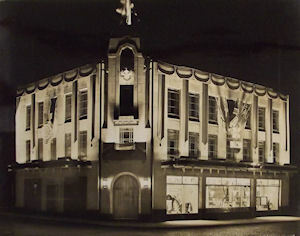 The decorations to several of the buildings will be impressive, notably - the Town Hall, the police station in Manor Road, the electricity showrooms, also the frontage to Mill Lane Hospital and the adjacent Corporation's Works Depot. The Marine Lake at New Brighton will be decorated with flags and streamers, and the illuminated launch will be a feature of the lake at night. The New Brighton Pier and promenade will, of course, be a brilliant sight later in the evening with miles of fairy lights. The whole of the street decorations have been designed by the borough engineer. About six weeks ago, the residents of Acacia Grove, thought they would like to give the children a Coronation open air party. They formed a committee, viz :- Mesdames Conroy, Clutterbuck, Hind, Williams, Pryce (treasurer) and Mrs. Brown (secretary) with three male helpers, Messrs. H. Walker, A. Foster, and C. Davies. They collected weekly subscriptions from neighbours and held whilst drives in the secretary's house. It is hoped to give a party to the children of New Street, Bridle Road, and Briardale Road and Acacia Grove. The Capitol Dance Band will provide music. There will be races for the children, all of whom will receive Coronation cups and saucers and also handkerchiefs and toys - all presented by Mr. and Mrs. Stacey. Eighty children and adults will enjoy a street party. A Coronation cake has been presented by Mr. Price of Byron Road. Here, too, a band will attend, and there will be dancing from eight till midnight. Sixty children will have sports and a party in the street, while for the adults a party and entertainment has been arranged to be held under cover. The children will receive a medal as a souvenir. The street will be adorned with fairy lighting and floodlit at each end. The Mayor (Councillor G.L. Reakes) is to present prizes to the children who have succeeded in the sports. There will be community singing, a concert by local artistes and a conjuring exhibition by Professor A. Roberts. Jimmy Smith and his boys will provide music. Mr. A. Roberts, a newcomer to the grove, offered to take charge of the children's sports and will act as organiser and M.C. besides presenting the prizes. 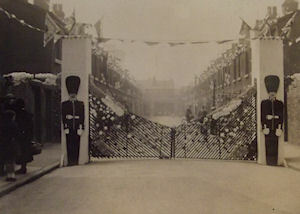 Final plans include a party for 150 children in the recreation ground behind the Electricity Showrooms and sports and races, on Coronation Day. If the weather should disappoint the party will be held in St. Thomas's Hall, Liscard. All the children will receive souvenirs. On Thursday a motor-coach trip for children and parents will run through the Mersey Tunnel and round Merseyside. The children will be taken free of charge. Those who have taken a leading part in making and arranging decorations are Mesdames Corrigan, McCormick, Sprackling, Parry, Truman, Hooligan, Dwyer and Messrs J. McCormick, snr. J. McCormick jnr., J. Wilson, A. Wilson. T. Edwards, Truman, M. Wilcox and Palin. A party is to be given to fifty children in the street on Coronation Day, races will be run for prizes and each child will receive a souvenir cup and saucer. Later the adults will have a party provided out of funds and held in their houses. The street will be illuminated by electric lighting. The organisation of the events has been carried out by T. Preston (sec). and R. Preston (treasurer). The neighbours have arranged to give a tea in the Wesley Hall, Liscard to two hundred children and adults. Children's races will be run in the street for prizes and each child will receive a souvenir. The chief decorative artist has been Mr. E. Sackey. Mrs. Robinson was treasurer. 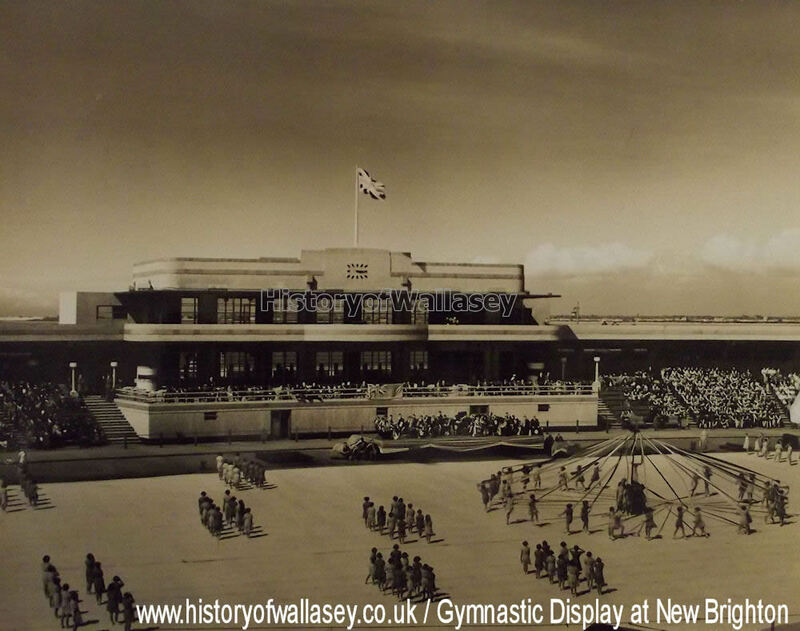 The spacious floor of the New Brighton bathing pool served this afternoon as the arena for a display of physical culture and country dances by 1,200 pupils of the Wallasey secondary and elementary schools. 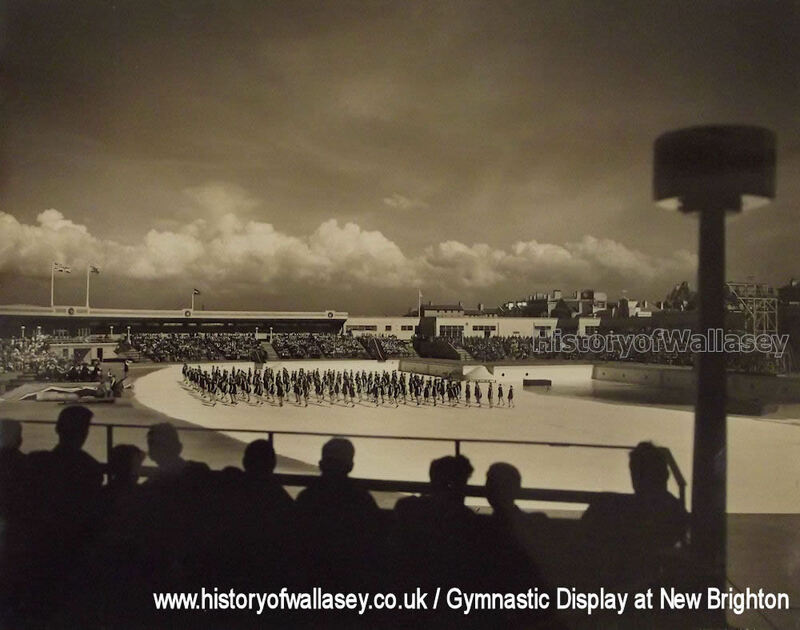 This picturesque exhibition of what is being done to improve the health and fitness of the young folk of the town was witnessed by about 10,000 spectators, consisting chiefly of other school children and their parents. To the accompaniment of the band of the 1st Battalion of the Argyll and Sutherland Highlanders, the entire body of performers took part in an opening march round in double file. When all were assembled in the baths arena, they joined lustily in the singing of the National Anthem. 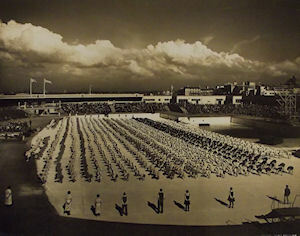 A kaleidoscopic effect was produced by the rainbow colours of the gymnastic costumes and sashes worn, and was enhanced by the dazzling whiteness of the specially-painted floor of the arena. Country dances by a selection pf the senior girls was followed by an amusing display by the junior boys of games and agility matwork. The junior girls then came into the picture with the Maypole and country dances, the senior boys following with games and tableaux. After the singing "Land of Hope and Glory" by all present, the secondary boys and girls in turn gave an excellent exhibition of gymnastic exercises and the whole 1,200 performers then joined in a rhythmic evolution display. The Mayor of Wallasey (Councillor G.L. Reakes) was present in his robes of office, accompanied by the Town Clerk, Mr. Emrys Evans, and members of the Council. The whole programme is to be repeated this evening, when the general public will be admitted. There was an attendance of twelve hundred at the civic service for prayer and consecration in preparation for the Coronation at the Town Hall on Sunday evening. The Mayor (Councillor G.L. Reakes) attended in his robes and chain of office, and was accompanied by many members of the Town Council. Those present included representatives of all the religious denominations in the town, members of philanthropic and social organisation's, etc. The singing was most impressive, accompanied by the organ, presided over by Mr. Eric Barlow. The Rev. W.S. 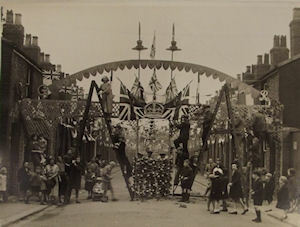 Coad, rural dean and vicar of St. James Church, New Brighton, who delivered the first of two addresses, said that although the Coronation was accompanied by most impressive pageantry and by the sound of martial music, they ought not to be satisfied with that alone. There must be a quiet offering of the heart in absolute sincerity to the Throne of Grace. In Westminster Abbey on Wednesday the King would be seen in quiet simplicity kneeling before the altar and receiving the Bread of Life, enabling him to do that for which he was destined. The rejoiced that their new King was a religious man who would uphold to the utmost of his power the moral standards of his God. They prayed that King George VI and Queen Elizabeth might be upheld by the Grace of God to be of benefit not only to our own beloved country but to the whole world. It is wonderful to think of 400,000.000 loyal people with their eyes turned to Westminster. It was the love of God which kept the Empire together, and the Empire had been brought together by God for a purpose, some fulfillment of which they would see in the reign now beginning. The Rev. Hermon F. Johnson (poulton Road Methodist Church) said they were all convinced that their Majesties were entering upon a glorious reign, and that they would lead this great nation and commonwealth of nations to greater heights. By nature and grace they were equipped for their great task, and all their people wished them God-speed. Just as the King and Queen consecrated themselves in the service of the country, the people in turn should dedicate themselves to the land they loved. Patriotism was not enough if they desired the maintenance and furtherance of all that was best in our national life, and there must be a dedication of ourselves to certain great causes - the causes of peace, freedom, justice and religion. It was religion and not Kings, statesmen, and soldiers that had made the England we knew. If they loved their country they must all get back to God and His holy ways. 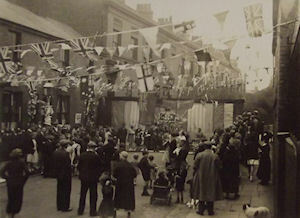 An overflow service in the Brighton Street Methodist Church, attended by about 300, and at which the deputy-Mayor, Alderman F.H. Thornton, was present, was conducted by the Rev. J. Goldsborough (Claremount Road Methodist Church), and addresses were delivered by the Rev. W.J. Philpin (All Saints' Church), and the Rev. Eric Lawson (Rake Lane Congregational Church). The Mayor (Councillor G.L. Reakes) paid a visit to fifteen schools on Tuesday afternoon and made brief speeches to the scholars, who were assembled for the tea parties and presentations. The schools visited included St. Joseph's R.C (mixed), St. Alban's R.C (mixed), Vaughan Road Infants School, Central Girls, Riverside Junior Boys, Riverside Infants, Riverside Junior Girls, Somerville Juniors (mixed), Somerville Infants, Somerville Senior Girls, Manor Road Senior Boys, Egerton Grove Juniors (mixed), Egerton Infants, Church Street Junior Boys and Gorsedale Senior Boys. When the Mayor reached Poulton Junior Boys the party had broken up, the length of the programme of visits being responsible for the late arrival. The Mayor, however, decided to visit Poulton schools at an early date, and also other schools in the borough which could not be included in Tuesday's tour. "I will never forget seeing so many happy children. We owe a great debt to the teaching staff for the way they make the children happy. The decorations were delightful, "" stated he Mayor to a "News" reporter at the conclusion of the tour. At Gorsedale Road Schools, Seacombe, commemorative oak, ash, birch, and elm trees were planted by the captains of the school "houses" so designated, and each of the four boys were presented with a new Coronation florin. Wallasey civic procession from Manor Road Schools to the ancient parish church of St. Hilary, where the service was held, made stately spectacle for large crowds lining the main parts of the route. The procession was composed of the following :- Mounted Police, band of the 1st Battalion and Argyll and Sutherland Highlanders, Royal Naval Volunteer Reserve (Mersey Division), 178th Battery of the Lancs. and Ches. Heavy Brigade, R.A (T.A. ), 4/5th (E. of C.) Battalion The Cheshire Regiment, Lancs and Ches. Anti-Aircraft Cadet Battery, police, firemen, Men's V.A.D., British Red Cross Society, Women's V.A.D., St. John's Ambulance Association, Wallasey detachment, ferrymen, motor-bus men, postmen, boys of the Sea Training Homes, Boys Scouts and Wolf Clubs, Boys Brigade, Girl Guides, representatives of local orgainsations and institutions, co-opted members of committee of the Town Council , principal officials of the Corporation, Justices of the Peace, councillors, alderman, ex-Mayors, Mayor's Chaplain, Mayor's Sergeant and Mace-bearer, the Mayor, Deputy Town Clerk, ex-Mayoresses. The following members of the Council attended the service :- Alderman Atkin, Airey, Brick, Charlesworth, Dale, Evans, Flanagan, Milward, Thomas, Thornton, Councillors Apperley, Ashton, Baker, W.D. Burrows, Bellis, Blackshaw, Crichton, Dingle, Gill, Griffiths, Hannaford, Hall, Hardy, Masefield, Pennington, Rees Williams, Swain, Todd, Wensley, Wilson, Young. The Rev. S.G. Barton conducted the service. Representing the Free Churches were the Revs. R.F. Chisholm, E.J. Lawson and J. Goldboroughs. The lessons were read by the Rev. E.J. Lawson. Two hundred children were entertained to a treat at the Embassy Rooms through the generosity of a large number of people who had supported the effort promoted by the New Brighton Children's Outing Association and organised by Mrs. G. Balshaw. The committee consisted of Mrs. E. Crellin (chairman), Mr. G. Balshaw (hon. secretary), Mr. and Mrs. Payne, Mr. and Mrs. Hughes, Mrs. Lewis, Mr. McGovern, Mr. Duncan, Mrs. Willis, Mr. and Mrs. Merill and Mr. G. Willis hon. sec. Association). The children thoroughly enjoyed their repast and on returning home were each given a bar of Coronation rock, an orange and a new penny. They were delighted with the entertainment provided by Miss. B. Balshaw's clever Coronation troupe of dancers consisting of Betty Roberts, Peral Balshaw, Patty Walsh, Margery Smith, June Ridgeway, Maureen Flinn, and the turns given by Dorothy Drew (tap dancer) and the Two Babettes (June Ridgeway and Margaret Lutus). During the evening the Mayor and Mayoress visited the children and expressed to Mrs. Balshaw their admiration of what had been done for the enjoyment of the little guests. Last Christmas the organisation gave a treat to 200 children at the Tivoli. An outing for 300 children to Magull has been fixed for September. Captain Stacey and his good wife were busy all day in Byron Road. They helped at the tea and games and Captain Stacey presented each child with a Coronation cup and saucer. Mrs. Stacey, not to be outdone, placed a little handkerchief in each cup. The Capitol Cafe dance band played in the street until early morning and visitors and residents alike enjoyed the day's celebrations. Mr. John Tobin supervised and carried out his unenvious job extremely well. Byron Road was, by the way, the first street visited by the Mayoral party. A huge Coronation cake presented by Mr. and Mrs. Price of Byron Street, was cut by Mr. F.H. Thornton (acting Mayoress). The children of Shakespeare Road, assisted by several grown-up children, got through three gallons of ice cream, seventeen dozen fancy cakes, ten dozen bottles of mineral water and tea and sandwiches, fruit and cream -- ? Mr Hewitt, of Hewitt and Booth, the proprietors of the pipe cleaner factory in Shakespeare Road, donated £3 to the fund and Mrs. Hewitt performed the cake cutting ceremony. The committee engaged a band but the band did not arrive, but an impromptu but quite efficient band kept on until the wee small hours. The high winds and the deluge of rain wrecked the decorations on Tuesday night but not to be outdone, the men went at it again on Wednesday morning for the third time since Saturday and the street was as good as ever when the Mayor arrived. Mr. Lew Jones acted as M.C. for the dancing, while Mr. S. Thomas was at the piano. Abbotsford Street, off Church Road, Seacombe, was a village on its own. Residents had roped off both ends of the road and each was picketed. The Mayor did not open the proceedings, cut any tapes or cakes, make any speeches, because the committee had forgotten to extend an invitation. Just the same, the residents had a good tea, the children especially, and races, sports and dancing was carried on during the afternoon and evening. The adult race was won by Mrs. L. Gartland, Mrs. Cheetham and Mrs. Thompson. Nearly every resident of the street entered for some race or other and the winners included Messrs. J. McDermot, J. Martin, Joseph Gartland, S. Williams, W. Gartland, Miss E. Molyneux, Mrs. R. Critchon, Miss. 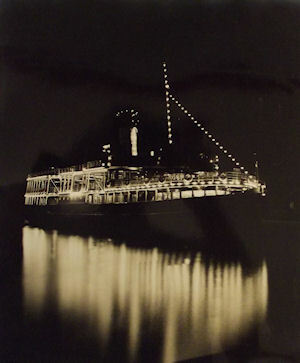 P Gartland, Miss. G. Williams, Miss. W. Littler, Miss. M. Crabtree, Mr. H.W. Littler, Mr. H. Wainwright, Miss. R. Bee, Miss N. Taylor and Master B. Thompson. 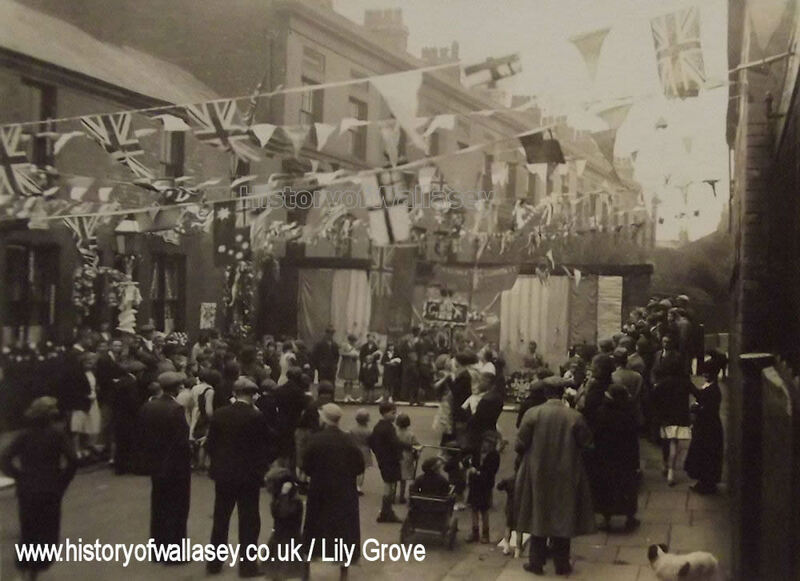 The celebrations in Lily Grove opened with singing and dancing in the streets, Jim Smith's band providing the music. At. 3.30pm nearly 90 children were lined up and headed by the band they marched up to the Social Club, St. Paul's Road, for tea. Ninety young children cheered the Mayor when he arrived and Mr. T. Foy responded to the Mayor's remarks. The afternoon sports were preceded by an entertainment by Professor Smith a local conjuror. but the best disappearing act had already taken place -- at the tea table, Miss Betty Smith sang and gave a clever display of tap-dancing followed by three other versatile performers, Miss Lily Morgan, Miss Norah Stott and Miss Buckley. Mr. George Williamson, always a favourite at parties in the district delighted the children with songs at he piano, while Mr. R. Littler and Mr. Prosser concluded the programme. Mr. Roberts of Lily Grove, was a capable M.C. and he was assisted by a band of willing neighbours. Dancing to the wireless went on until one am. The children of this street were fortunate in having as patrons, the Birkenhead Brewery Co., who sent a gift of sweets. Mrs. Newcombe of the "York" Hotel who supplied ices and the Wirral Mineral Water Co., who donated minerals for the children. The prize-winners in the races were as follows :- Girls : Joan Pugh, Kathleen Cavanagh, Mildred Goulden, Grace Pugh and Vera Green. Boys : Richard Doyle, George Whitby, Robert Delap, Alan Holland and Arthur Smith. Tiny tot's race : Charlie Minner. Ladies : Kathleen Ashurst. There was a good crowd of residents assembled round the tables in Hawthorne Grove and the Mayor and Mayoress were well cheered. It did not take long for the children to start their tea. The adults had tea afterwards and the children played games. 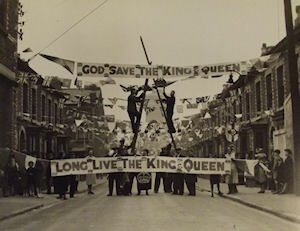 There were very happy celebrations in Granville Terrace on Coronation Day culminating in a jolly tea for the children complete with balloons and favour's and all that goes to delight the kiddies' hearts. In Rossett Place and adjacent streets, the fun was just as good and in the former a really fine piece of work was displayed, a model of the Queen Mary executed to scale by Mr. Edwin Williams of Rossett Place and brilliantly lighted after sundown. Moseley Avenue, too, was beautifully decorated with loyal greetings and dancing was indulged in till quite a late hour. Another cul-de-sac in the neighbourhood which had been very attractive was Pear Tree Grove. Ten-years-old Eileen McFarlane of Primrose Grove, Seacombe was crowned Coronation Queen on Wednesday just before a party was given to nearly 50 children. The Mayor opened the proceedings and the fun was carried on after tea when the children were presented with trumpets and Mr. W. Sedgwick improvised a band. Mrs. Leay, Mrs. Taylor and Mrs. Lightfoot were in charge of the arrangements. 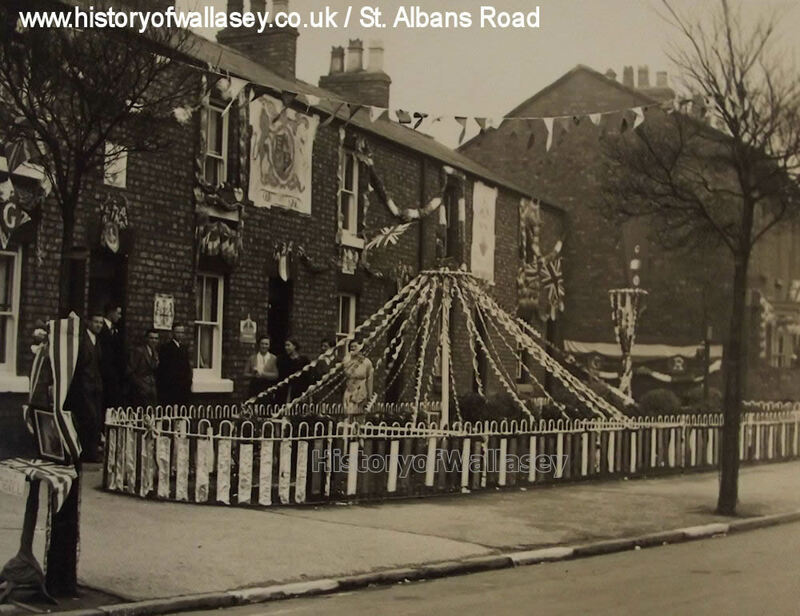 The residents of Palatine Road and Woodview Avenue only decided 10 days ago to hold a children's party in the street, but, chiefly due to the fine work of Mrs. L. Williams, Mrs. M. Wynn, Mrs. Amery, Mrs. M. Moore and Mrs. Smithers nearly 60 children had a really happy time. Councillor G. Russell and the Mayor had lent a hand towards financing the party, but owing to an oversight the Mayor had not been asked to attend the celebrations. Not to be outdone, however, little Miss Annie Wynn, ran down to Lily Grove for the Mayor and brought him back, hand-in-hand. Most of the residents of this road heard the broadcast service from London in the street as a radio set was brought out into the street. Four-years-old "Pops" Johnston is a proud Queen to-day. She was crowned Coronation Queen by the Mayor and she presided at a party with 100 of her friends. 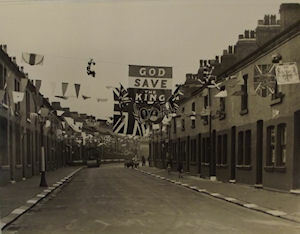 Mrs. Openshaw, and Mrs. Weir arranged the party and Mr. McWilliam organised race and dancing in the street afterwards. The residents of Parry Street decided a fortnight ago to hold a party for the children but in those two weeks they collected over £5. Out of the fiver 60 children had a party, received a Coronation cup, saucer and plate, sweets and fruit. How the residents of Parry Street managed to do that on £5 no one will ever know, but they did it and what's more, they had races afterwards and presented prizes. Eighteen pounds of slab cake, 112 fancy cakes, 100 oranges, 4 lbs. of sweets, 1½ gallons of ice cream, tea, bread and butter and fruit vanished suddenly when 80 children of Oakdale Ave. sat down to a tea-party in the street organised by Mrs. Henderson, Mrs. Read, Mrs. McGraw, Mrs. Walker, Mrs. Mazier and Mrs. Marlowe. The children waited for some time for the Mayor to arrive but he didn't so they attacked the 18lbs, of slab cake, 112 fancy cakes, 100 oranges, 4 lbs. of sweets. 1½ gallons of ice-cream, tea and bread and butter! Mrs. 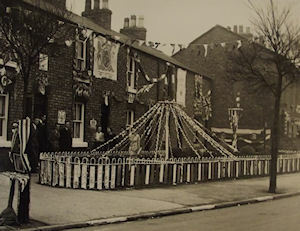 I. Davies and Mrs. Bates were responsible for 50 children having a party in the decorated street. The Mayoress (Mrs. F.H. Thornton) cut the Coronation cake (and took a portion with her) and Ald. Dr. Dale and Councillor Bellis also attended. One resident of Cherrybank Road dragged a piano out into the street so that young people could dance in the evening. The gaily-decorated street presented a pretty scene when, after 50 children had enjoyed their tea-party the mAyoress cut the cakes. There were two Coronation cakes presented by friends and workers who arranged the tea included Mrs. T. Griffiths, Mrs. G. Roberts, Mrs. H. Cornah, Mrs. J. Atherton, Mrs. Kelly and Mrs. Gregory. Mr. J. Gratton designed a clever trellis-work archway across Larch Road, and the men of the street erected it. it looked very charming and a coloured ribbon was stretched across the entrance waiting for Ald. Dr. Dale and Councillor Bellis to cut the ribbon and declare the party open. When they did cut the ribbon, the little girls, dressed in dresses made of Union Jacks and the little boys in sailor suits cheered and cheered. Each youngster received a Coronation cup and saucer and after the tea the following children sang and danced : Peggy Herion, Lily Walker, Cecilia Bickerton and Joan Herion, Mr. Jack Gratton and Mr. and Mrs. Walker also entertained the children. Mrs. S. Langton, Mrs. E. Scrugham, Mrs. E. Herion, Mrs. W. Crompton, Mrs. G. Povell and Mrs. J. Clarke were the committee in charge of affairs. 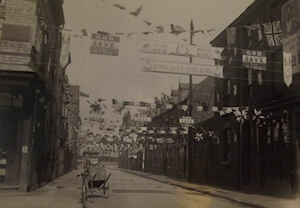 When the Mayor party arrived at Short Street off Ashville Road, Seacombe four years old Maureen Pope presented Mrs. F.H. Thornton with a tri-coloured sheaf of followers and 5 years old Arthur Neville with a cigarette case. The Mayor and Mayoress were genuinely surprised at this charming gesture and they suitably replied. A band attended in the afternoon after tea was over and Mr. J. Ashley took all the children for a drive in his car. Mr. and Mrs. W. Halton, Mr. J. Edwards and Mrs. D. Neville were in charge of the celebrations. On Thursday, Mr. W. Hindley gave the children of Short Street another party in honour if Dennis Brown, who was celebrating his sixth birthday. Sheila White and her brother Joe entertained the party in the afternoon with a display of step-dancing. The Mayor was quite delighted at his present from Short Street which is next to Middle Street, so when Mr. H. McTeer invited him into his house to drink to the children's health, the Mayor pocketed one of the Coronation mugs (after draining it) as a memento. Mr. Lyndsay Clegg (Deputy Town Clerk) followed the Mayor's example. Close on 200 children from Guildford Street, Union Street, Gresford Place, Water Street and Darlington Street was assembled in Guildford Street on Wednesday afternoon when Ald. and Mrs. D.P. Charlesworth arrived to formally open the festivities. The Alderman and his wife were cheered to the echo and they both accepted the invitation to "stay for tea". Ald. Charlesworth had presented the children with a huge coronation cake and Mrs. Charlesworth cut it. She was deeply touched when the oldest resident of the street, Mrs. Gerard, who has lived in Guildford Street for over 41 years presented her with a bouquet of red and white and blue flowers. The Mayoral party arrived later in the afternoon after the children had been presented with a Coronation cup each, Mr. F. Pumford and Mr. Bradshaw arranged races and games after tea and Miss. Joyce Jenkins and a friend, both from the "Chrysanthemums" danced for the children in the street. The dancing and the festivities were carried on until 10.30 pm with the aid of a piano. Mrs. J. Locke, of Guildford Street, although she had been bed-ridden for some time with rheumatism, was the leader of the committee, which included Mrs. C. Clarke, Miss. A. Winrow, Miss. N. Winrow, Mrs. Jenkins, Mrs. F. Pumford, Mrs. Lloyd, Mrs. James and Mrs. Lynch. The committee, who worked very hard were ably assisted by nearly 30 neighbours who had tea in the street later in the afternoon. 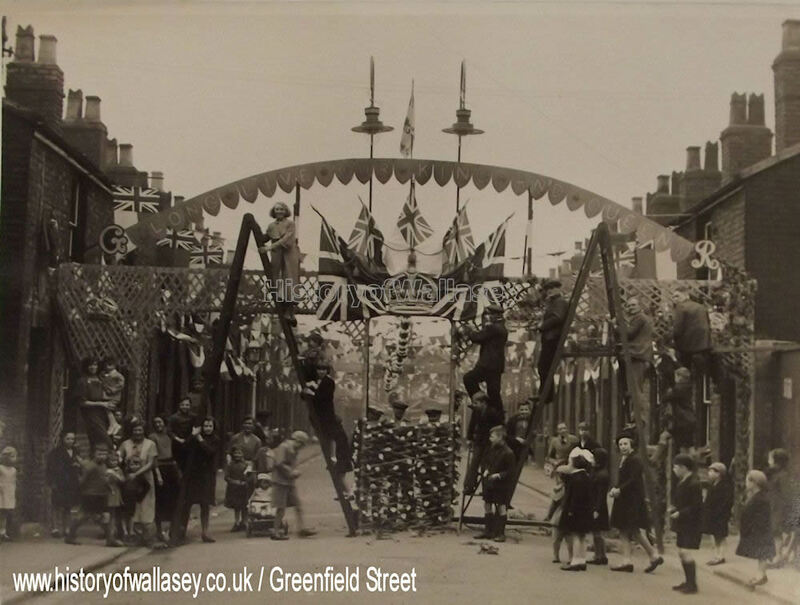 The centre of attraction in Liscard on Coronation Day was undoubtedly in Greenfield Street, Rossett Place, St. Alban's Road and Conway Street. Sixty-three children marched to the Wesley Hall for tea and afterwards the Mayoral party visited the street and admired the now famous portrait of their Majesties done in oils by 17 years old Edward Sackey, of Greenfield Street. The street was gaily decorated and was admired by hundreds of passer-by. The committee who worked so hard included Mr. G. Blakemore (chairman), Mr. F. Oakwell (vice-chairman), Mr. and Mrs. W. Robinson, Mr. A. Ward, Mr. and Mrs. C. Thornton, Mr. and Mrs. J. Upton, Mrs. Christy, Mr. and Mrs. Littler, Mrs. Hatton, Mrs. Fogg, Mrs. Sackey, Mrs. E. Blakemore, Mrs. Oakwell, Mrs. Parker and Mr. W. Robinson. Everything went off as arranged by the Conway Street and St. Albans Terrace committee on Wednesday and on Thursday evening. 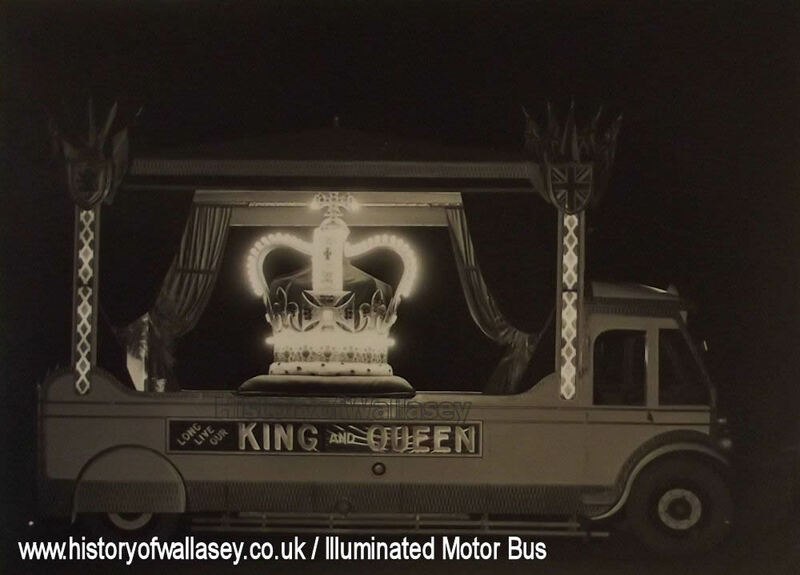 Eighty children and 50 adults went on a charabanc trip round Wallasey, Birkenhead and Liverpool via the Mersey Tunnel. Pitt Street evoked much admiration and the party was conducted around by the residents. Each child was presented with a bottle of lemonade, an orange and biscuits. Councillor and Mrs. Hannaford, who formally opened Wednesday's celebration had tea with the party and later the Mayoral party paid a visit. The Gaumont Palace, the Trocadero, and the Marina are showing a great film at the crowing ceremony in Westminster Abbey, on Monday and throughout next week. Every detail of those historic moments is clearly revealed and the sound effects give to the picturisation a reality at which the watcher must glow with wonder and pride. No one, especially no child, should fail to see this picture -- the first of the sort ever made.